Almaty and surroundings is the most popular area for travelers in Kazakhstan – and with good reason. 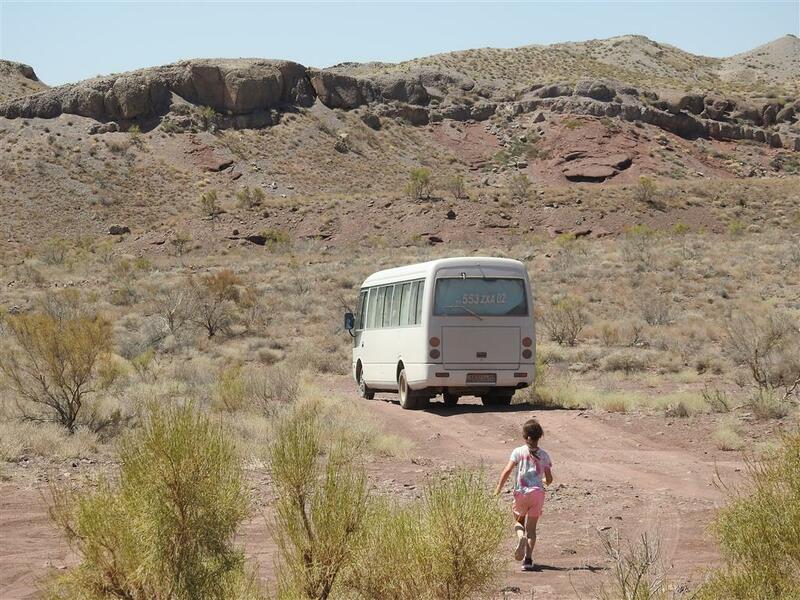 Here you will find many different landscapes, as well as memories of the past, on a relatively small surface. For those who are mainly looking for emptiness and tranquility: don’t worry, you will encounter much of these in Almaty province. The Green Ring route leads past the most interesting and beautiful places in this area. You will visit the Altyn Emel National Park, with its remarkable and colorful mountains, and wildlife (gazelle, wild donkeys). Your journey continues via Charyn Canyon to the Kolsai & Kaindy mountain lakes, enjoying beautiful landscapes along the way. On this trip you can walk a lot and even ride a horse if you wish. You will stay outside Almaty in small guesthouses and in Almaty in a three-star hotel (we can upgrade if you like). 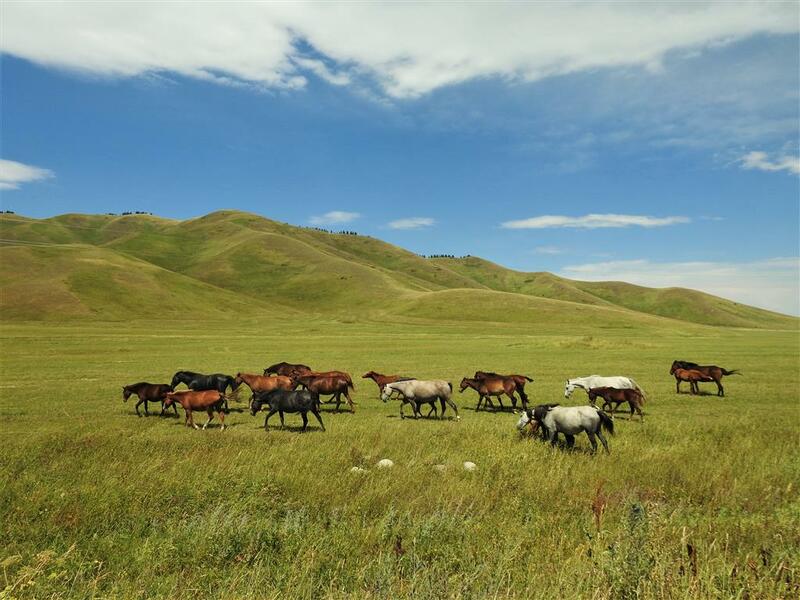 The tour in Almaty Province can be shortened if you have fewer days off. Meeting in the airport, transfer to the hotel, resting. A sightseeing tour round Almaty in the afternoon for four hours, including visits to the Republic Square with the monument of Independence, Panfilov park with its wooden Cathedral, the Green Bazar a.o. 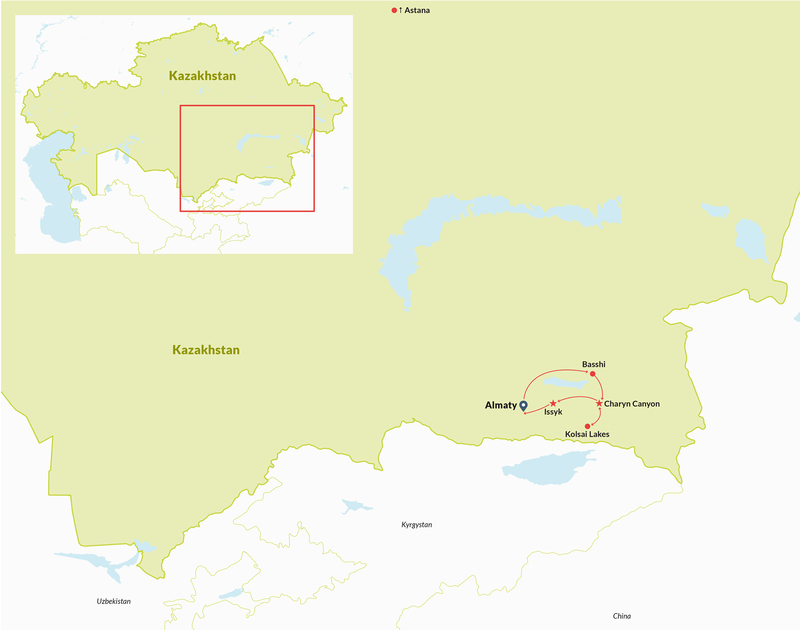 We leave Almaty, drive to the north and leave for the national park Altyn Emel, to the north of Lake Kapchagai. In this large park there are a lot of different phenomenons to explore and enjoy: wildlife, and you stand a chance to see wild donkeys (kurgan) and steppe antilopes (djeiran). Nature has created here, far and away from any sand desert, an enormous sanddune that you’ll be given a chance to climb. This so-called Singing Dune will produce a low monotonous sound once you slide from it. You’ll have dinner and spend the night in a small guest house in the village of Basshi. We drive through the national park towards the Aktau (‘White’) Mountains, and explore its canyons, followed by a visit to the Kakutau (‘Volcanic’) mountains. Dinner and night are spend in the same guest house. On the way to the Kolsai Lakes we exchange the semi-deserts of Altyn Emel for steppe landscapes where herds of horses roam freely. We end up in the village of Saty, base for exploration of the Kolsai lakes, and situated in another subsequent ecosystem, namely the high mountains. After lunch in Saty you will enjoy a visit (by car) to Lake Kayindi at a 45 minutes drive, famous for its tree trunks rising from the lake, a very nice picture. Incidentally, a dive in one of the lakes (Kolsai and / or Kayindi) is recommended, but cool! You return by car to nearby Saty for your dinner and overnight at a Kazakh family home. The first Kolsai lake is situated at 1800 meters altitude. The second lake is 9 kms away from here, and you reach it either on foot or on a horseback – a brave ride! (The renting of horse is not included in our offer, but can be arranged locally, as well as hiring a local guide). You will spend the whole day at the beautiful mountain lakes. Full board at the guesthouse in Saty, with lunch in a box today. You’ll end the day at the hotel in Almaty. Before reaching it, visit to Charyn Canyon is scheduled, 110 kms north of Saty and on the route to Almaty. This is perhaps the most popular natural phenomenom in Almaty Province at 220 kms from the city. Here we have a picnic and stroll among the magnificent rock formations, and along the river Charyn. Further to Almaty you will visit a small eagle museum – with real species – because the area of the canyon is also the hunting ground of the traditional berkutchi, or the hunters and their preying birds. Lunch is on the way in a small restaurant. Close to Almaty in the village of Issyk you will pay a visit to the Golden Man Museum, with treasures from the surrounding burial mounds from the Sakh period. In the evening you return in Almaty and will be taken to your hotel. You’ll be transfered to Almaty Airport for your flight back home. Most international flights leave Almaty in the early morning. The cost of this program at four persons €695 and at two persons €995. For other group sizes please write us for an offer. Not included in the offer are the international flight tickets, the remaining lunches and dinners, and all not mentioned services.